Researchers at MIT have found a way to detect early-stage malarial infection of blood cells by measuring changes in the infected cells' electrical properties. The scientists, from the laboratories of MIT's Anantha Chandrakasan and Subra Suresh—who is now president of Carnegie Mellon University—have built an experimental microfluidic device that takes a drop of blood and streams it across an electrode that measures a signal differentiating infected cells from uninfected cells. The work, published Aug. 8 in the journal Lab on a Chip, is a first step toward a field-ready, low-cost, portable malaria-detection device. 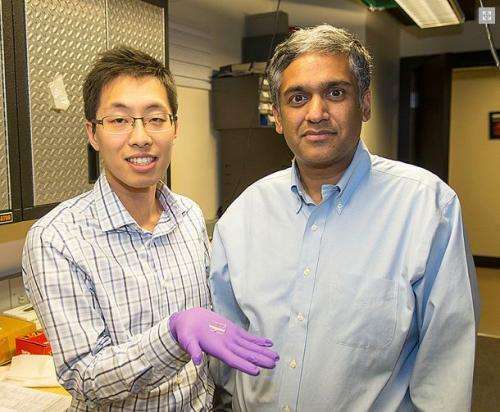 "Ultimately the goal would be to create a postage stamp-sized device with integrated electronics that can detect if a person has malaria and at what stage," says Chandrakasan, the Joseph F. and Nancy P. Keithley Professor of Electrical Engineering and a principal investigator at MIT's Microsystems Technology Laboratories (MTL), who specializes in developing low-power electronic devices. Similar diagnostics may be applicable to other infections and diseases. When the malaria parasite Plasmodium falciparum infects a red blood cell, the cell becomes more magnetic and more rigid, properties that can be detected in a rapid-diagnostic device. But these changes are hard to detect before the parasite matures beyond the ring stage—its earliest stage, and the only stage found in circulating blood. At later stages of infection, the infected red blood cells adhere to small capillaries, blocking circulation and causing various symptoms, and even death in severe cases. So the researchers decided to look into using electrical impedance as a diagnostic signal. Several types of infection, including malaria, alter a cell's impedance, a measure of electrical resistance across the cell membrane. Studies had already measured electrical changes in later-stage infected cells, but it wasn't clear that cells that had reached only the ring stage of infection would exhibit electrical changes. To find out, first authors Sungjae Ha, a graduate student in the Chandrakasan lab, and Sarah Du, a postdoc in the Suresh lab (also known as the Nanomechanics Laboratory), built a microfluidic device capable of measuring the magnitude and phase of the electrical impedance of individual cells. The device is essentially a cell-counting device, similar in approach to other low-cost, portable devices being developed to diagnose illnesses such as HIV. The challenge, however, involved optimizing the electronics to allow very accurate measurements of impedance for each cell as it passes by. The researchers had to minimize interfering electric signals from the substrate the blood flows over and prevent the cells from sticking to one another. In tests of cells of four cell types—uninfected cells and infected cells at the ring, trophozoite and schizont stages—the device detected small differences in measures of magnitude and seemingly random differences in phase, but not quite enough to definitively differentiate among stages. However, by mathematically combining the measures into an index called delta, the differences between uninfected cells and all three stages became clear. "It's much more significant," says corresponding author Ming Dao, a principal research scientist in the Nanomechanics Laboratory. "It's a more holistic approach. By using all of the information we can measure, we can detect the differentiating signals much more clearly." "What's really cool about this device is that it can actually differentiate between uninfected red blood cells and circulating ring infected red blood cells even though the parasite is still very small at this stage and the host cells have hardly been modified," says Matthias Marti, an assistant professor of immunology and infectious diseases at the Harvard School of Public Health, who did not participate in the study. Malaria is a curable disease, but diagnosis remains a challenge. This ability to discern the circulating parasite's stage from a drop of blood opens the possibility of building a device that could be used to rapidly diagnose malarial infection in places where laboratories and skilled medical personnel are scarce. Traditionally, technicians detect malarial infection visually, by observing blood smears through a microscope. More recently, the World Health Organization has supported the use of rapid diagnostic tests that detect an antigen to the parasite in the blood. These tests provide results in about 15 minutes and do not require skilled technicians, so sick people can be diagnosed and treated on the spot. But neither of these approaches is very sensitive, Marti says. "For a new device to be meaningful in the field, it would have to be more sensitive than these traditional approaches, as well as cheap and quick." The collaborative MIT team of experts in microfluidics, circuit design, materials science and microbiology has designed their new cell-differentiating technology so that it can be packaged as a low-cost device, but more work needs to be done. "We are using our combined expertise to push the technology toward real-world applications," Dao says. Since this new detection method can, for the first time, differentiate among the three major stages of Plasmodium falciparum's asexual development, Marti sees another potential application: The device may also be able to distinguish cells infected with the parasite at its transmission stage, the stage in which mosquitos can pick it up from humans and transmit it to other humans. "If we could use the device to detect malaria infection and the potential for transmission at the same time, that would make it even more interesting," Marti says. The next steps for further development involve integrating this new technology into a small, low-cost package. "Our hope is that such technologies as those described in this work will ultimately help meet the need for a new generation of portable, disposable and inexpensive diagnostics for a variety of human diseases," Suresh says. The team is also interested in using the device to investigate the electrical properties of other types of diseased cells to see if electrical impedance changes could be used for diagnostics. The paper is titled "Electric impedance microflow cytometry for characterization of cell disease states."